The puppy has to have lived for a minimum of six months or since birth in a rabies free country. If your puppy isn't from a rabies free country, then this means you have to WAIT until the puppy is old enough for a rabies vaccine, PLUS an additional 30-days. In Chispa's case, she came from Germany, which is on the list of rabies free countries, and travelled through The Netherlands (also on the list), and departed from AMS airport, in The Netherlands. So, all good from that perspective. Taco, my sheltie, came from Spain in 2018, and Spain is also a rabies free country by the CDC definition. So, all good there as well. Of course, if you read the FAQ HERE, you'll see a lot of “mights” and “mays”. Basically, this means that if you are in a bad mood, or if the Customs and Border Patrol officer is in a bad mood, or inclined to show his/her authority, you may still have difficulty bringing your puppy in once you've arrived at your USA destination. In MY case, with Chispa, the border patrol officer, despite being shown printouts of all of the laws and regulations, which I'd printed out for just this reason, didn't understand the meaning of the regulations he was supposed to uphold, and put his foot down on making me sign a dog confinement agreement. Of course HE said it was for the good of MY puppy, that the government didn't want my puppy to die from exposure to rabies carried by a USA animal, but, sorry, that's hogwash. The confinement agreement is CLEARLY intended to protect USA animals from outside sources (and since when has the government cared about MY puppy over protecting its own interests? Right, guys). So, I signed a confinement agreement. And after about 12 hours in a sherpa bag, Chispa desperately needed to get out and potty and poop (yep, she held it ALL that time). You can draw your own conclusions. With Taco, I also had printouts from the CDC website, including an updated page that clearly stated that dogs who have lived in a rabies free country for a minimum of six months OR since birth did NOT need a confinement agreement. The CBP agent agreed with me after conferring with another agent, and Taco and I were on ourway. All in all, bringing a puppy home from Europe was really not any more eventful than bringing a puppy home from any location. Then again, I've traveled overseas with dogs over a dozen times, maybe getting close to TWO dozen now, and so although there's always SOME sort of drama associated with the bureaucracy that needs to exert its will with the paper stamping business, I'm pretty comfortable with the process as a whole. The rules are pretty clear, but like anything, it comes down to knowing your rights, knowing your responsibilities, being cordial to those who hold the pen/stamp/power, and hoping that they're having a good day themselves. Of course, that's just the paperwork/legal side of things. What about the trip? Chispa had never been in a crate or a sherpa bag prior to me getting her, so I booked the flight home such that we'd have 48 hours before needing to get on a plane. This gave her some time to bond with me, get over the trauma of leaving her litter, and also gave me some time to work on getting her comfortable in her sherpa. I made sure to have some pee pads with me for the trip, and you can see one on the floor of her bag in the picture above. On the evening prior to the morning of the flight, she had her last drink of water and her last bite to eat. She'd get some treats during the flight, but I wanted to make sure her bladder was empty. Yes, it's a long time for a little puppy to go without food or water, but a healthy puppy can stand that if it's a one-time thing. Shoot, probably lots of wild dogs/coyotes/wolves as puppies go far longer without food or water and are just fine. In any case. I made sure I had a little bullystick for her to chew on in her crate, and a little puppy kong, and some cream cheese to stuff in it. And, the day prior to the flight, Anna and Chispa and I walked around Enschede, Netherlands, Chispa in her Sherpa, getting used to the jostling. She seemed happy to look out at the world from the bag as long as she was on my shoulder and as long as I was moving. We took her to a restaurant for dinner the evening prior to the flight, and she sat in her bag quietly under the table while Anna and I ate, and while I waited for a phone call from USA Team Coach Nancy Gyes (hoping for that call, which I GOT!! )…the call that every team member hopeful anxiously waits for. Taco was just about as easy. His breeder was kind enough to give him cookies for going in to a sherpa bag before I took possession of him. 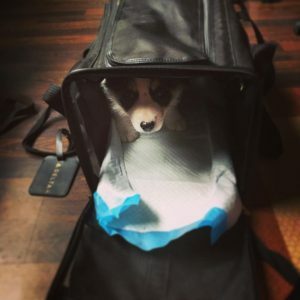 When I arrived in Madrid, the breeder met me, with Taco, handed him over, as well as his paperwork, harness and leash, and some food and a toy, and we were on our way. I spent the night in a hotel room with Taco, and the next morning, we turned around and headed home. He also was able to hold it until we got to Atlanta, and, once through customs, he happily pottied and was fine for the rest of the trip back to Portland. Do your homework, and be prepared for the worst, but also, know that it CAN work out! I hope this helps you out if you're considering bringing home a puppy from Europe!